The Property Care Guys specialize in design and installation of quality Reticulation systems for new and established properties around Perth. PCG design and install all types of watering systems including waterwise pop-up heads for lawns or mechanical drives, running of the mains or bore. An in-ground battery operated reticulation control system may be a low cost solution for a small yard as it saves the hassle of running wires or removing paving or concrete etc and run for two years before needing to replace the batteries, which only takes a minute. On the other hand, a fully automated 240 volt remote-controlled reticulation system may be better suited for a larger property. We have seen so many cheaply done irrigation jobs fail so quickly we just can’t honestly treat customers like this and run with the money. We believe it is best for business to install something which costs us more, is long lasting and reliable and be proud of the job done and hopefully be of assistance for the long term. We tend to use a combination of the latest materials and what is most suited for the job to create a system which should give you not a few months, but at least 10-20 years of good use with minimal repairs. What’s more, we don’t even charge a huge amount for a quality install. We also assist by also offering our regular maintenance service. 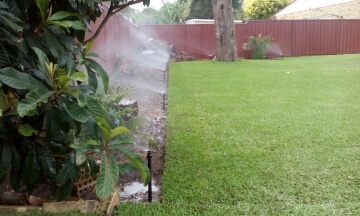 If you’d like a new sprinkler reticulation system installed to a residential or commercial property just fill out the online booking form or give us a call and we will provide you with an estimate within 3 days and usually have your new retic complete within 2 weeks. After the job is complete and paid for we even provide a free service to tweak anything following the installation. 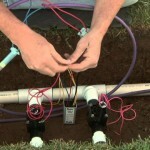 The Property Care Guys have many years of experience repairing and installing irrigation. We can come to your commercial or residential property to see what is suitable.